Human body is a complex structure with highly sophisticated detail. The major factors influencing the body shape are the skeletal configuration as well as the distribution of muscles and body fat. Body type is not just the way the body looks, but it also determines the response of the hormonal and sympathetic nervous system (SNS). Train for the right body shape – whether you’re ectomorph, endomorph or mesomorph – and you can outsmart your genes. When you look at your naked body in the mirror, what do you see? Unless you are some sort of genetic muscle mutant, your body will fall into one of the three typical body shapes. Once the body type is figured out, a suitable diet and exercise plan can help you achieve your goals. The theory of Somatotypes introduced by US psychologist, Dr. William H. Sheldon in the 1940s classifies the human bodies into conventionally three body types: The long and lanky Ectomorphs, the naturally athletic and brawny Mesomorphs and bulky but soft looking Endomorphs. The theory states that eating according to one’s specific body type helps reach individual dietary goals faster. 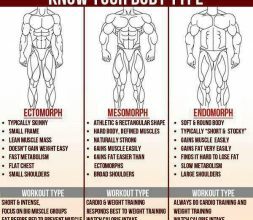 Below you’ll find some of the endomorph’s main characteristics. Some of the metabolic traits common in endomorphs: slow metabolism,gain weight easily,lose weight slowly,good ability to gain muscle,excellent digestive system,slow digestion,highly efficient nutrient absorption,excellent tolerance to fasting,low activity of the nervous system (slow), i.e. slow reaction time ,not very sensitive to stimuli, good pain tolerance,trouble regulating body temperature in hot, humid conditions,cool skin,oily, moist, smooth and thick skin with good elasticity,low energy levels: sluggish and calm, even lethargic, attacks of tiredness/ fatigue ,minimal nonessential movements,sleep well,low sleep requirement,low neuromuscular tension and sluggish thyroid. 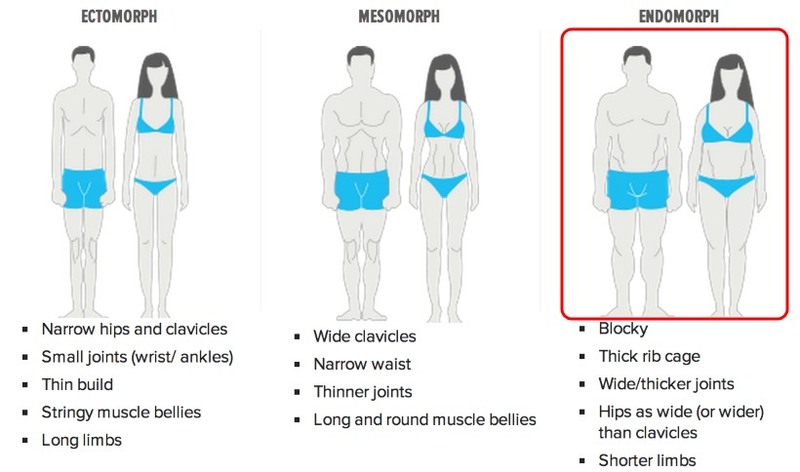 Endomorphs tend to gain weight easier than other body types and then endomorphs have greater difficulty losing weight than the other body types. It is this exasperating combination that has many endomorphs at their wits end and leaves many endomorphs fighting a losing battle against overweight and obesity. Endomorphs tend to get poor results when following nonspecific diets that do not address and have not been adapted to their needs. What works for a friend, might not work for you. And emulating their diet or exercise regime that successfully transformed their body might do nothing for you. Endomorphs respond best to a diet and workout plan that takes their body type into consideration. Overall goal – strip away body fat , increase fitness, balance body shape if needed ,do workout with higher intensity, train often enough and do the right type of exercise. Follow a diet for endomorphs and don’t do endless crunches to try and spot-reduce, don’t exercise for hours at low intensity (aka long, slow, steady-state cardio) and don’t eat/ drink sugar-rich foods.